The Tanzania Agricultural and Livestock Policy of 1997 identifies overstocking and overgrazing, as well as a lack of innovative options for meeting the needs of mobile and sedentary pastoralists as some of the major challenges facing the nation’s pastoralists. To date, these challenges affect the quality of life of pastoral communities, limit livestock production, and can lead to conflicts between livestock keepers and farmers. Securing grazing lands and improving rangelands for livestock is therefore crucial for healthy rangelands, healthy livestock and healthy people. Researchers, government bodies and other stakeholders have been working to solve these challenges, and progress is being made. A total of 95,499.869 hectares of grazing land has been secured for livestock keepers in Kiteto district, Manyara region, supported by a collaborative project involving the Ministry of Livestock and Fisheries, the National Land Use Planning Commission (NLUPC), the International Livestock Research Institute (ILRI), and local Civil Society Organization, KINNAPA Development Programme. The grazing area is shared by Amei, Loolera, Lembapuli and Lesoit villages and is named ALOLLE, from the names of the villages. Protection of this land will go a long way to reduce conflicts among the land users, a problem which has historically plagued the region. It will also improve productivity of the land and enhance its biodiversity. 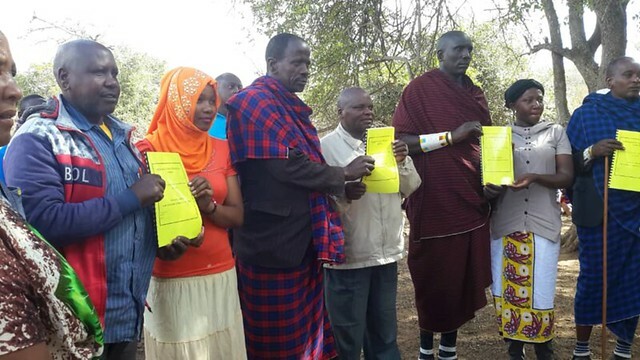 Representatives of Amei, Loolera, Lembapuli and Lesoit villages holding their signed agreements on the ALOLLE grazing land in Kiteto District, Tanzania (photo credit: Stephanie Fuchs/Kiteto District). ALOLLE is the most recent achievement for the Sustainable Rangeland Management Project (SRMP) and the joint village land use planning process it supports. The process is supported by Tanzania’s land policy and legislation and facilitates securing and sharing resources across village boundaries. The project previously helped secure 30,000 hectares of grazing land in an area known as OLENGAPA, shared by four villages Orkitikiti, Lerug, Ngapapa and Engang’uengare, all in Kiteto District. The agreement, signed on the 7 September 2018, left community members hopeful of the change this will bring to their villages. ‘Our livestock will now move freely without any disturbance from other land users,’ said Lang’ututi Lengiok, a livestock keeper from Loolera village. The district commissioner of the Kiteto District Council, Tumain B. Magessa welcomed this achievement. ‘Having the shared grazing areas of ALOLLE and OLENGAPA is a major milestone in our district. Secured grazing lands for pastoralists will not only ensure sustainable use of rangelands but it will also reduce conflicts between pastoralists and farmers. Development will be stimulated. Less time will be spent on resolving conflicts between land users. I recommend that this innovation of joint village land use planning be implemented in other villages in the district to resolve the prevailing conflicts between pastoralists and farmers’. Stephen Nindi, director general for the National Land Use Planning Commission (NLUPC) affirmed the government’s support of the land use planning process. ‘The government is committed to ensuring that the process of village land use planning is expedited to improve productivity, conserve biodiversity and reduce land use–related conflicts in the country. Securing grazing lands for pastoral and agro-pastoral communities will reduce the conflicts between pastoralists and other land users such as farmers, protected area authorities and investors. At the same time, it will improve economic development and sustainable management of rangelands’. SRMP also worked with the communities to establish the ALOLLE Livestock Keepers Association which will be granted group Certificates of Customary Rights of Occupancy (CCRO) for the area. The capacity of the communities to better manage their lands will also be enhanced. Not only will this lead to improved rangeland management, but also to more productive livestock, more resilient livelihoods and a reduction of conflicts between land users. The project is also working to support other districts to implement the approach. The Sustainable Rangeland Management (SRMP) project aims to secure grazing land to pastoralists, agro-pastoralists, small holder farmers and improve rangelands through village land use planning. 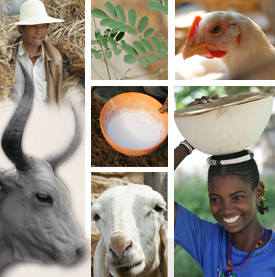 SRMP is implemented by ILRI, the Ministry of Livestock and Fisheries, and the National Land Use Planning Commission. The project works in collaboration with Civil Society Organizations, districts councils and local communities. It is financed by International Fund for Agricultural Development of the United Nations, Irish Aid, the International Land Coalition, ILRI and the government of Tanzania. Read a related article in Tanzania’s Daily News ‘Finally land dispute resolved between herders, farmers in Kiteto‘. Tags: IFAD, ILC, Irish Aid, NLUPC, press release, SRMP. Bookmark the permalink. Reblogged this on ILRI news.